The Crowning Jewel to your Holiday Feast! 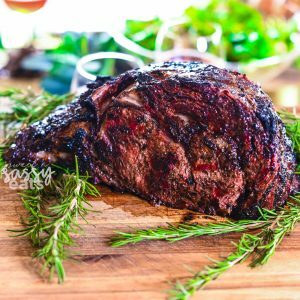 When I think of Christmas Dinner, I think of a rich and luxurious meal surrounded by family; and Smoked Prime Rib Roast is one of those rich and luxurious cuts of meat. 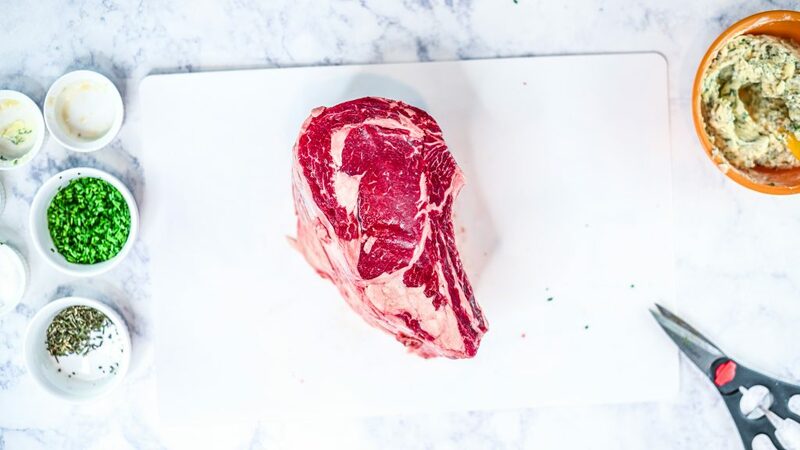 Your guests will be super impressed with this beauty at the center of your meal and everyone will be begging you for more! If you follow my recipe and tips, you will be the Christmas Dinner Hero! The quality of your meat MATTERS! 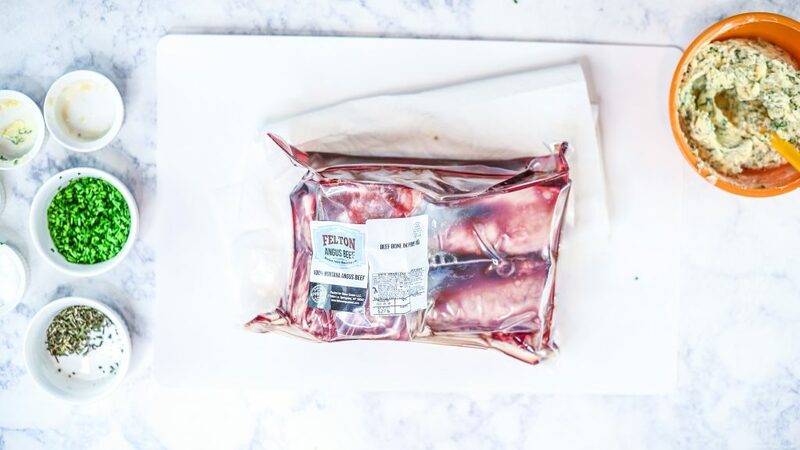 This is for a Holiday Feast or a special occasion, so make sure you pick quality meat. It is so important to know where your meat comes from and that you trust them! 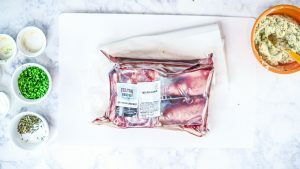 I recently met the owner of Felton Angus Beef at a food blogging conference and knew right away I wanted to try their products. So I ordered one of their multi packs and their delicious Prime Rib to make the best Smoked Prime Rib! 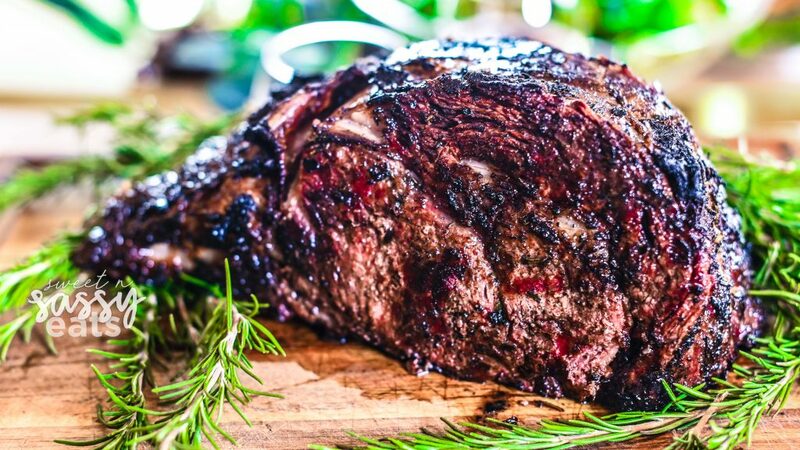 The great thing about Felton Angus Beef is that it is a Montana Family Owned Cattle Ranch. So by purchasing from them, you support a small family farm that takes great care in their cattle and beef. There is no middleman, so it comes straight from the farm to your table! It is 100% Montana Angus Beef that is Pasture raised and ranch finished, giving it the best taste of both worlds! They do not use any growth hormones either. It is so important to know where your food comes from and especially your beef, you don’t want to question what country they come from, what they are fed or what they have been injected with. When you purchase your beef from Felton, you become a part of their family, and I just really love that! Planning for a crowd? It might be hard to figure out how much meat you need to purchase and cook. 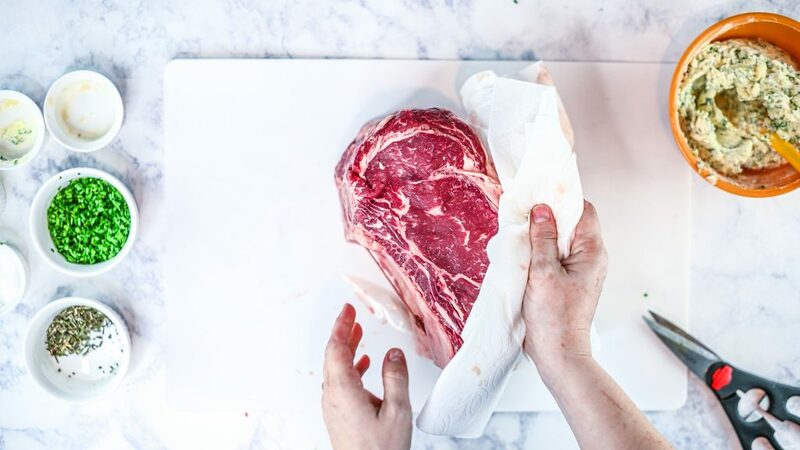 When buying bone-in, plan for about 1lb of raw weight per adult. This will account for the bone weight and loss that happens when cooking. Now, this is for hefty appetites and wanting leftovers. For smaller appetites, I would plan for 1/2-3/4lb per adult and you will be able to enjoy some delicious leftovers. Also, ask your butcher to cut the bones off and then re-tie them on. This way you can season all sides of the beef but still cook it with the benefits of the bone. Make sure to completely dry all excess moisture from your roast before you rub the herb butter all over it. If you do not, the butter will have a hard time sticking to your roast. I say this ALL THE TIME in my recipes, but a GOOD THERMOMETER MATTERS! I can’t even keep track of how many times I purchased a $20-$50 thermometer that maybe worked the first or second time I used it, but then it would break or didn’t seem to be accurate. So, in the garbage, it went! Now I ONLY buy from Thermoworks! I love their products and my food comes out perfect every time! I use them not only for when I cook meats but even when I cook bread or rolls, for when I am making my caramels too! 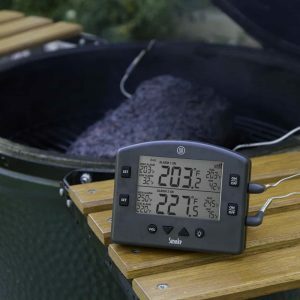 For long cooks, I like to use the Smoke Thermometer so I can constantly monitor the temperature even without being right by my oven or smoker. It has a receiver that gives me real-time meat temperature and the temperature of my smoker. I also like to use my instant read Thermapen MK4 to check other areas of a large piece of meat to ensure even cooking. If you can only do one, I recommend the instant read because it is more versatile. The Perfect Entree to any special occasion! 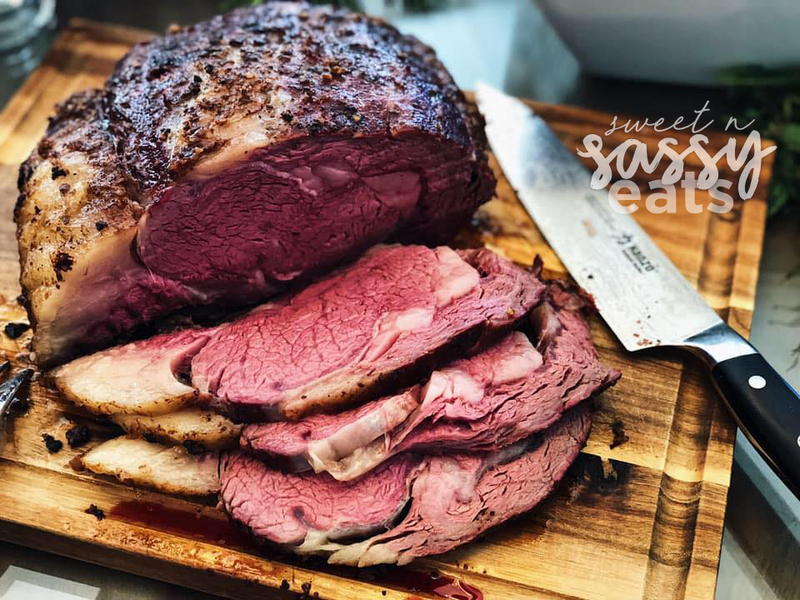 Choose this Smoked Prime Rib, if you really want to impress your guests! Preheat your Smoker or Oven to 225 degrees. Liberally cover the meat on all sides and in between the meat and bones with the horseradish herbed butter. Rest for 15 min before slicing... I have found that using a Brisket knife cuts my roasts the best.